An annual favorite, come enjoy an autumn adventure as we’ll start with a visit to the Harry London Chocolate Factory. We’ll have free samples and a chance to shop their pre-Thanksgiving sales. Next, we’ll visit the village of Sugarcreek, including a special back-roads tour with a local guide who will share a unique perspective about the Amish people and the world in which they live. Sugarcreek also hosts the World’s Largest Cuckoo Clock with life-size, moving costumed figures! We will enjoy a bountiful lunch at the Dutch Valley Inn Restaurant, followed by plenty of time to shop at their craft shop and meats, cheese and bulk foods store. Next, we’ll see the shops and boutiques of Walnut Creek and complete our day tasting wine at the Perennial Vineyard and Winery! 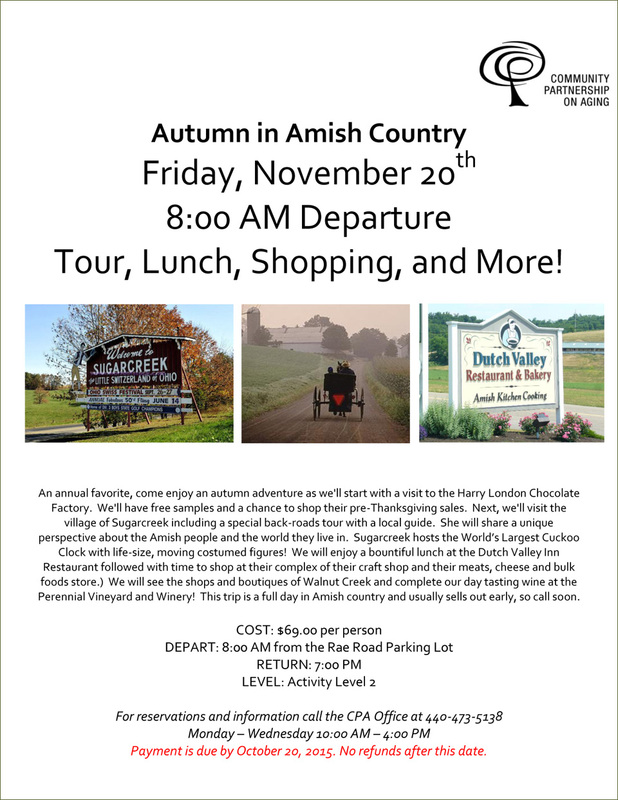 This trip is a full day in Amish country and usually sells out early, so call soon. Please see or click below for the full flyer with details about this fun trip!